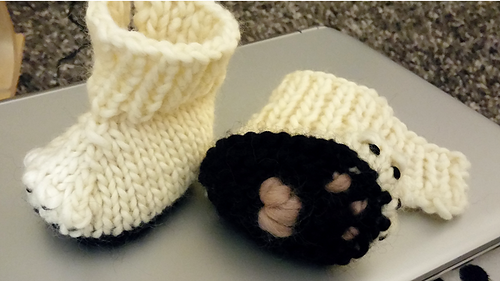 My friends’ dog has been the inspiration to create this pair of booties and a matching hat for their baby. Both patterns have been released at a special price when you buy them together through the end of the year. 30 35 metres / 33 38 yards of (100% Wool Super Bulky, 54 yards / 50 grams) in off white. 20 25 metres / 22 27 yards of (100% Wool Super Bulky, 54 yards / 50 grams) in colour for the sole. 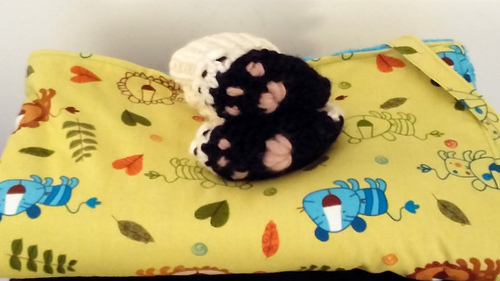 A couple of metres / yards in super bulky yarn to make the paws (pink or brown shade). A few cm / yards to sew the claws (black. 6.5 mm US 10½ DPNs or 80 cm 32” circular needles.